A mega evening of Euro Disco Dance music entertainment comes to your city! 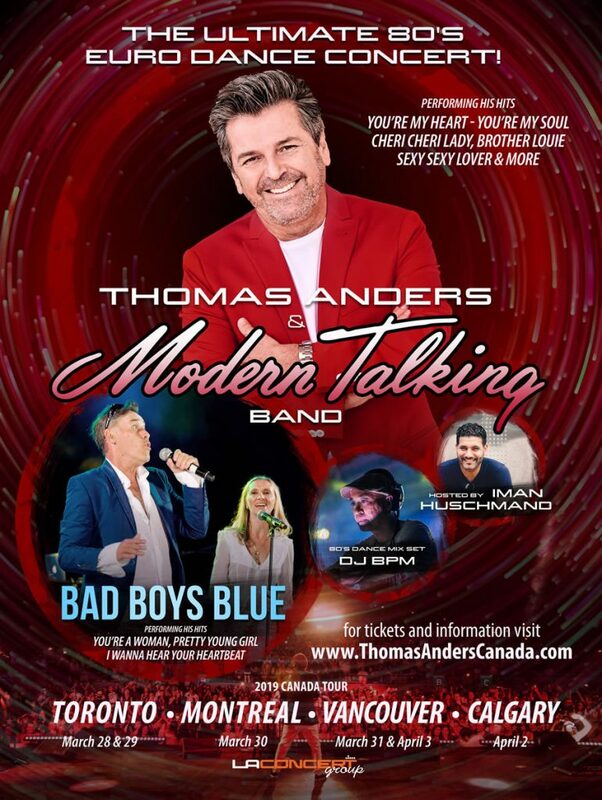 Dance to 3 hours of high energy music featuring The Gentleman Of Music — Thomas Anders (the original magnetic voice of Modern Talking) accompanied by the Modern Talking Band! Also hitting the stage is Bad Boys Blue featuring John McInerney! Reminisce to 80’s songs with opening entertainment by DJ BPM from LA spinning the best of 80's hits as soon as doors open. Join us with our dynamic event MC, Iman Huschmand from DC. So put your dancing shoes on and come on over for this historic night! John Edward McInerney is a British-German singer, songwriter, and the front man of the band Bad Boys Blue. He is the only band member from the original line-up of the group still performing. The history of Bad Boys Blue started in Cologne (Germany) back in 1984, when the founders of Coconut Records — Tony Hendrik and his wife, Karin van Haaren (vel Karin Hartmann), decided to create a new music project. They planned to look for members of the new group in England, but finally they found them in Cologne. The original line-up was following: John Edward McInerney (born September 7th, 1957, Liverpool, England), Trevor Oliver Taylor (born January 11th, 1958, Birmingham, England, died January 19th, 2008, Cologne, Germany) and Andrew Freddie Thomas (born May 20th, 1946, Los Angeles, USA, died July 21st 2009, Cologne, Germany).